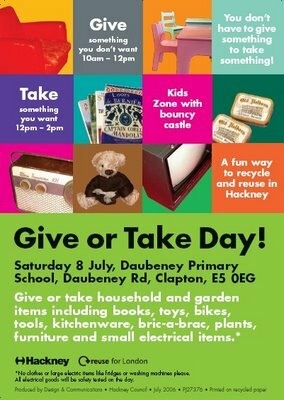 On Saturday 8 July at Daubeney Primary School, the Hackney council recycling team will be holding the 3rd Give or Take Day for local Hackney residents. Give or Take days are a community waste exchange event – an opportunity for residents to give unwanted items like furniture, bikes, toys, tools, books, kitchenware and bric-a-brac, and then take something they might like or need. As well as providing residents with the opportunity to give or take unwanted items, the event also helps reduce the amount of waste that builds up in Hackney. I am aiming to get as many people to this event as possible so if you would like to send this post, please click below on the letter caption to "Email post" to friends or relatives. It will be a fun, activity-packed community based day. Check previous goods from the 2nd Give or Take we held in Woodberry Down, N4.